Sarasota, FL (October 20, 2016): David Weekley Homes, the nation’s largest privately-held builder, is proud to announce the start of a signature home, The Chelsey, that will be showcased in Home & Design magazine in 2017. Each year, the publication selects a home to feature in the magazine’s May issue that incorporates local and national industry trends. 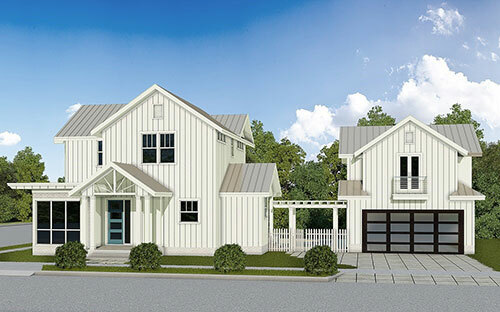 The Chelsey is a modern farmhouse-style home with four bedrooms, three full bathrooms, one half bathroom and two-car garage that will be located on Osprey Boulevard in historic Laurel Park. Furthermore, the home includes an entertainment room, wet bar area and additional half bath in the space above the garage. This prime location is one of Sarasota’s earliest neighborhoods and a National Register of Historic Places District. With roots dating back to the 1920’s, downtown Sarasota’s Laurel Park is the urbanist ideal of a walkable community. The custom home will have access to jogging trails, biking, playground, skatepark and tennis center in nearby Payne Park, in addition to the top-rated Gulf beaches. Homeowners can enjoy the nearby arts and museum district, as well as proximity to downtown, waterfront, dining and entertainment. For more information, or to receive updates about David Weekley Homes in Sarasota, call 855-209-8287. A rendering of The Chelsey, Home & Design magazine’s 2017 Signature Home.